Leaving Linda in the States to bet on her 2 to 1 chance of getting the real stuff rather than the placebo, I got up at 3 to return her rental car and get to the airport for a 6:00 flight. Which, I learned on arrival, had been delayed two hours .. maybe three ... for maintenance. Thus missing connections. Only took an hour to rebook me on a red eye from Boston, with a voucher for cab fare and dinner, because it didn’t leave until midnight. So Linda and I got to spend the day nearly together: me in the clinic waiting room, she inside being prodded, poked, injected, and instructed about how they would start the clinical trial tomorrow. They seem to have been confident enough of her inclusion to have already got the medicine on hand. 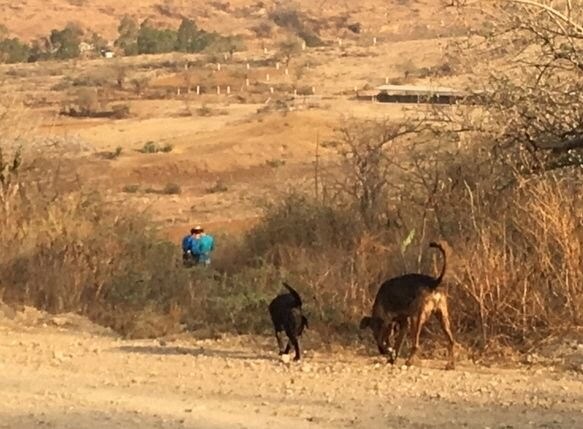 So I got home to Santa Cruz Etla mid Saturday morning after 29 hours of travel and a stretch of 56 hours in which I had logged only four hours of sleep. After loving on Qalba for a half hour or so, I crashed, wrestled with my cold to try to get the coughing and sneezing under control, and during intermittent bouts of wakefulness tried to talk my temperature down from its 2+ degrees of fever down to its normal 36.1 (that would be 97 north of the Río Bravo). 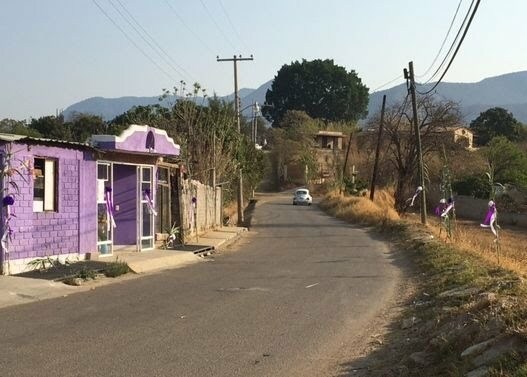 n the way back to the house, that the purple shrine to the Virgen de Juquila had been bannered up for the holiday. Cheered and fed and exercised, I decided to go to a noon concert in Oaxaca up at the Santo Domingo Monastery Church, the most beautiful and spectacular religious building in all of southern Mexico. The last leg of my flight home, departing Mexico City at 6:00 AM, flew full, and my seatmate was a man of substantial size, muscular and completely bald. I figured him for a retired pro wrestler. He asked me if I was going to Oaxaca on vacation and I said no, I live there, and himself? “By chance the chamber-music duets at Santo Domingo? Beethoven, Franck, and Dvorác? You and the lady who just stowed her violin in the luggage bin four rows forward?” I’d read about the program a couple of days ago in the on-line Noticias newspaper. Once he had recovered from the shock, and explained that indeed he was the pianist, we kept up a lively conversation all the way to Oaxaca, where we exchanged cards and I promised to come if I had successfully stifled my cough. I’d allowed for bloqueos on the way to town, but there weren’t any, so I got there and parked a half hour early. I decided to take a swing through the Zócalo to see what was happening before heading up to the monastery. A tried to cross Independencia at Alcalá, a Policía Vial held me up. I hadn’t seen any protest signs, I mean except the usual ones, no commandeered busses drawn sideways to close both lanes, no bull horns. “What’s going on?” I asked him. “The bishop,” was all he said. ‘Palm Sunday." Suddenly I was overwhelmed by a sense of deja vu. To anyone of a certain age who spent the 60s and early 70s in la Madre Patria, the Motherland of Spain, the rhythm and the tonality of those phrases must bring back memories of Franco’s Spain and its political-religious processions, followed shortly thereafter, what with Palm Sunday coming just before final university exams, with protest marches and the acrid smell of tear gas on the spring wind. Hard to accept that that was a half century ago! garlands and flower tiaras, wooden book marks, mangos on a stick. And, of course, palm branches: figures woven of palms, palm fans, spikes of braided palms, crosses made of or adorned with palms, gaily painted Vírgenes de Juquila confected of palm and sugar. After waiting in line at the monastery gate and being screened —for weapons? Bull horns?? All I know is that they made me check my cough drops at the desk! How random is that ?— I was let into the entrance corridor. “Concert or museum?” they asked each of us, and then directed all of us to proceed in the same direction. Twenty steps and we were in the monastery cloister: a large open stone-paved space, like a city square, with a fountain in the center, surrounded by a two-story gallery, its arches sharply delineated by a noonday light that was almost blinding. Immense, simple, elegant, overpowering, just the way the Dominicans wanted it to be. “Don’t mess with us, you recently-converted Indians, you heterodox Christians who deviate just a little bit from the mandatory practices and beliefs! We are God’s Church. We are power. We have the power. And don’t you forget it!” Outside, facing the street, the central image on the church’s façade is Saint Dominic, his spread cloak sheltering Christians of all stations. Church and cloister together they proclaim a single message. “In this Church you are all welcome: that’s an order.” It is hard for me to separate the wonderful things that the Dominicans missionaries accomplished from the fact that for most of its history they also ran the Inquisition. Halfway around the arcaded gallery to the left was the entrance to the great Museum of Oaxaca, though which most of the visitors seemed to be flowing. The rest of that gallery, was filled with folding chairs. In the corner sat a piano, and next to it a music stand. The concert was gorgeous. The three works, Beethoven’s Sonata 12:3 in B major, Dvorák’s Balade in D minor Op 15, and Franck’s sonata A Major for violin and piano, —Armando told the 150 or so people in the audience— were almost symphonic in their texture, and lush with romanticism. Viktoria and Armando (we were on first name terms since the airport) did them justice and then some. The crowning touch, clearly unplanned, was that just as the final note of the Beethoven faded, the monastery bells, in five long deep and resonant bonnnngggs, signaled the end of mass. Time to go home. I scuttled along the side of the church toward the street where the car was parked and stopped short at the corner of Cinco de Mayo. Forty teenagers in skull masks, all holding up placards. “If you know any kids who need us, tell them about us,” he says as he turns to go back to the group.